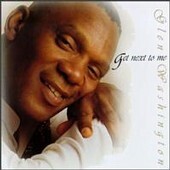 Glen Washington has had one of the most up and down careers in reggae music. His contact with such diverse people as Joseph Hill, Stevie Wonder, Leroy Sibbles, Shinehead and Coxson Dodd has made for a very interesting story. While most people know Glen as a singer, he has had an equally long career as a drummer, playing for countless bands in Jamaica, Canada and the Unites States. However it was Washington's album with Studio One three years ago that put him back on the map as a singer. Since then he has been in constant demand for recording and live shows. Since I spent so much of this interview trying to piece together the threads of his long and intriguing career, we didn't actually talk that much about music - maybe next time. Thanks to Ray Hurford, Brian Jahn and Jackie Watson for their help. Was your first recording for Joe Gibbs? My first real big recording was with Joe Gibbs. 'Rockers Nu Crackers'. I didn't even realize that song was so big until I went to England. Yeah, I went to England and they requested that I sing it on stage. And when I sing it ... whooa! You could see the reaction from people. Like ... He did that? Yeah, every review I got, I got a nice response. You told me that you had done a bit of work at Studio One before that. Yeah, I played on a couple of songs for this guy called Claude Bent. Claude Bent? I don't know him. He was recording some songs for Mr. Dodd. They called him Jacob. He's a bass player now, and lives in San Francisco. And you played drums for these tracks? Yes, I was playing drums on these tracks. Did you audition for Studio One? And Joseph Hill of Culture taught you to play drums. Yes, he was the one that taught me how to play that. He say, "Do this, do that, that no sound right, you off timing" (laughter). He's a serious teacher too. What happened is that ... when Joseph left the band in Spanish Town, I was the only one in the group that had any knowledge about drums. This was a group called 'Stepping Stone'. I was the only one that had a little knowledge about drums. We had a lot of gigs to do, and then, boom, Joseph got into a falling out with the guy that owned the club. This was Sidney Bennett from the Fountain Club. So you had to step in? I had to sit down to play the drums, and now we don't have no lead singer. I was the lead singer, so the thing they do was to pull the microphone up to the drums. Then they came up with this idea to get a goose-neck. Between Coxsone and Joe Gibbs, was there any other recording you did in that period? Did you ever record that song? Yeah, I recorded it. Everybody keep telling me, "Why don't you do a re-recording on it?" I plan to do it, after a while though. What label did that come out on? On the band label, 'Names and Faces.' That was the name of the band. Most of the members live in Canada now. Yeah, Stretch can give you the whole history on me. Because Stretch was a bad bad singer back in them days, that's who I used to fashion after. You didn't know that? Yeah, Stretch is a bad bad lead singer. He used to sing with a group called the Mercury's Band. I used to go watch them guys. So how did you go from there to singing at Joe Gibbs? You said you were just hanging around the studio. Yeah, one day I was in the studio, and they had this rhythm, it was the Joe Frazier that was playing. And they have this song, and this guy came to sing the song, and it wasn't working out on the rhythm. So I say, "Hey, I have a song", and nobody paid any attention, because I was just a little boy in the studio. So Errol Thompson, ET, the engineer, said, "Go sing it so we can hear." And that was 'Rockers'. Now, did you record any other songs? Because I've never heard any other songs on Joe Gibbs. No no no. I Haven't recorded any other songs for Joe Gibbs. After 'Rockers', I thought they had disbanded the song, because I didn't hear nothing about it. And I never collected any royalties for that song. Until this day, I have not collected royalties for that song. And it's still in print. It's still around. Yeah, and it's still pressing. So you didn't continue on with Joe Gibbs at the time? No, after Joe Gibbs I was more into .... like I got incumbered by the drums. I was more playing drums than singing over the years. I got stuck behind the drums. After Joseph Hill left, I got stuck behind the drums. They call us 'Sons Of Jah'. That was the name Joseph gave us. Did you do some live shows with Culture around that time? There were few little local shows. There was nothing that big in significance. And after Culture and Seymour Cummings ('Africa Stand Alone' producer) had their falling out, then came a group called ... One of the guys that was in this group was one of the original singers with Culture, before Kenneth. Before Kenneth came into the group, there was another guy who used to sing with Joseph. They went away and formed a group called The Mighty Threes, because there was three of them. They did songs like 'Sinking In The Mist', and Jacob Miller covered one of their songs. Remember this song: (sings) "All they do in the morning is to fuss and fight in the backyard"? I played drums on all of them songs. So this gentleman that was in the Mighty Threes used to sing with Joseph before? Yeah, he used to sing with Joseph before. That was when Culture was just starting out. He was singing with Joseph, and I don't know what happened, and they used Kenneth instead. This was when the group was just getting together. So after that you moved to New York? I moved to New York about seven years ago. Oh, so you were in Jamaica until seven years ago? No, I've been living in the U.S. for seventeen years. I moved to Detroit, Michigan in 1982. Why did you move to the U.S.? I came to the U.S. with my group 'Happiness Unlimited.' I was living in Ocho Rios, Jamaica. We were the resident band at the hotel, The Americana. It's now called the Sheraton. So, while we were there, one day we met these two sisters, the Andrews sisters. Stephanie and Bonnie Andrews from California. We were talking, having a conversation, and one of the ladies says she works for Stevie Wonder. She is his coordinator. In my mind I was saying "yeah, right." But, she said Stevie is coming to spend a vacation there, and she came down to scout out the area, to make sure and do different things. We didn't believe her at all, but one Saturday night we were on stage and playing with this guy, doing his show, and in walks this woman with Stevie Wonder. And the whole place was in an uproar. He already reserved front row seats, right in front. So he came down and sat right in front of the stage. After everybody settled down, we were doing our show, and he wanted to talk to us after. Because he was sitting there rocking, and he say he like the way the band sounds. So for about two weeks, every night he would come on stage and jam with us. The place would be packed. He get on stage .... one night he played drums, most night he played keyboards. That was fun. He came and jammed with us. He wrote a couple of songs for me. There was a song called 'Jah Business,' and 'Jah Coming.' And then there was another song that we made up right on stage, 'What You Talking About,' that musically we did a cover of it .... (sings): "What you talking about, say you don't like the reggae beat, you must be craaaaazy." We did it on the 'Tempted to Touch' rhythm, but 'Tempted to Touch' wasn't even around yet. So did Stevie Wonder encourage you to come to the U.S.? Yeah, he is the one that took us to the Unites States. Wow, I never knew that. All of these guys are in California, and I'm the one that broke out and decided I wanted to go on my own. Because, after the deal fell through ... it didn't happen like we wanted it to, because things were moving too slow. He wanted to record us, but with a different type of reggae beat ... an American type of reggae beat. It wasn't working, because we were the original thing. Did you guys break up when you got to the States? Well, we were in the U.S., in California for a little while, and then broke up. I went to live in Detroit with my wife. Because I was married to a woman from Detroit then. So I went to live with her, and we ended up raising kids. So I left the business for another five years. You were not drumming or anything during that five years? No, I was doing a regular job, working in an auto plant. I guess that's what you do in Detroit. How did you get back into it? Well, my love for music never changed, and I find that I was really really miserable without it. So I start telling my wife that I'm going to play music again. And she said, "No no no, either you are going to get a regular job, or we are going to be divorced." I said, "Honey, I don't know what you are talking about, when you met me I was in music, and I don't think I should give up my gift just like that." And she said, "either or either", so I said, "I'm sorry, whatever you want to do is OK with me". I made up my mind. Because, my kids, they were grown up then. So, how did you get back into the business? How did you start back in? Did you go to Jamaica or New York? This is when I met Leroy Sibbles. I was playing on a show for him in Detroit, and he liked the way I played. Yes. And he said he wanted me to come to Canada to play with his band in Toronto. So after me and my wife separated, there wasn't anything better for me to do in Detroit. I decided I wanted music all the way, so I started to dedicate myself to it. I would spend all of my time with music. How long did you live in Toronto? Back and forth, about four years. Were you playing the whole time with Leroy, or did you play with other groups as well? I played with Leroy Sibbles. After Leroy, I played with the Sattalites. Yeah, I went to Spring Break with the Sattalites. Did you ever come to Ottawa with them? Yeah, we came to Ottawa quite a few times. Yeah, I played drums with the Sattalites. I went to Quebec, into Montreal. I worked about a year with the Sattalites. I've got to tell you, they have never been my cup of tea. I have seen them, and I think they are fine live, but they don't really interest me too much on record. You know what I'm saying by that? I don't know ... maybe too much pop and not enough reggae. They never wanted me to sing. It wasn't even Jo Jo. It was more like Fergus didn't want me to sing too much. Because once I start singing (laughter) ... because I was singing from behind the drums for a long time, so I get used to it. And I was able to play and sing at the same time. Did you know Jo Jo Bennett from Jamaica? Because he used to record for Mudie's way back. I know Jo Jo from a long long time. My hook up in the group was really Bruce, the Dread. Me and Bruce used to hang out a lot. At this point, had Leroy Sibbles moved back to Jamaica, or was he still in Toronto? Yeah, Leroy is living in Jamaica now. He was the one that told me that I should record. One day me and him was riding in his car, and I say, "One day me ago buy a car like this, you know." He said, "Yeah man, you just record some tunes." (laughter). (laughter) ... Well, I don't mind telling you that you sound a little bit like him when you sing. Your singing style is a little bit like him. The raspiness in my voice. Well, that's what everybody says. ... But I know I don't sound like Beres Hammond. You sound more like Leroy to me. So, after the Sattalites, then what? You were still in Toronto for a while? Yeah, I was in Toronto with a group called Hit Squad. I formed that band. Here is how the Hit Squad came about. Lance Ingleton from L.I.P. Promotion ... they used to have shows at the Concert Hall and all over the place .... he wanted a band, real quick, to do a show with Lieutenant Stitchie. He didn't have a band to do it, so he called me up and said, "put a band together." That was my first time actually getting a gig like that, you know, getting a contract to put a band together. So I get some musicians, and after we rehearse and everything, and were getting ready to play we didn't have no name. And he wanted to know the name of the band, and I say, "OK, it's the 'Hit Squad.'" Out of the blue. Yes, the Hit Squad are still around. They play for me when I come to Canada. So how does Coxson fit into this picture? Wait a minute (laughter). We didn't get there yet. After doing some recording at Big Beat studio. Do you know Charles Sinclair? Yeah, he plays with Messenjah, he's the bass player. He got me to come over to the studio that they were building over on Western Road. This was Big Beat recording studio, 24 tracks. I used to go there every night, doing all these little things, you know, not getting paid or anything like that. Did a few recordings, because I was in Canada and nothing was happening. That's how I ended up with a bunch of songs that we are in court over now - trying to get them to not put them out. Because this guy, named R. G. Jackson, is trying to put out some recordings that are illegal. It's the same Big Beat label. So he still holds the tapes. Well, he got the tape because Big Beat is not interested in putting them out, so he took it upon himself to try to put them out. But it is not going to happen, because we are going to court, and somebody is going to end up in big big trouble. It is in litigation right now. I've learned about the business over the years. All them times I've been sitting down, I've been learning, and I've learned the business part of the recording thing. So they can't fool me now. That was then, this is now. So you worked up some songs? I found that I could write. Over the years I've written a lot of songs, hundreds of songs .... Where were we now? ... Coxson ... OK, I went to New York after I left Toronto. I got to New York because of Shinehead. He was hot then, and he was touring. He needed a drummer that could tour, because his drummer was messed up ... he couldn't tour. Was this the A-Team? Was that the name of the group? He wasn't working with the A-team, because A-Team was actually a free-lance group that would travel with Maxi Priest. Shinehead did not have a complete band. He had a bass player, keyboards, and guitar, but the drummer couldn't travel. The drummer can't leave the country, because he didn't have proper papers. So they wanted a drummer and they called me in Toronto, and sent the plane tickets over. And I decided to do it. That's when I left Toronto and came back to the U.S..
How long did you work for Shinehead? I work for Shinehead for over three years. We've been all over the world. My first time I went to Europe was with Shinehead. I've been to Japan. I've been all over the place with Shinehead. Did you record with him as well? No. You see, that's the thing now. Shinehead don't use the same musicians that back him to do his recordings. I think he would have made a better act if he had done that. Because he could get the same sound on stage. He is a budding musician, and at times he tries to do everything himself, which I think is crazy. You have to have professional sounds. But, that's his thing. When you were playing with him, were you recording with any other groups? Or playing live with any other groups? No, I wasn't doing any recording. After travelling all over - one time we went to Austria, and the promoters wanted the band back, they didn't want the artist. that was the time when Shinehead fired the band. Because (laughter) ... he got wind of it. They wanted the band to return, but they didn't want the singer. That was one of those things, so he fired the band. Didn't travel with us no more, started to move with some other people. After that happened .... this was after we went to Japan many times, gone to Columbia, Brazil, across Europe, went right across Germany, do to England and all them places, Bermuda, Trinidad and Tobago ... went all over the world, all over them places. Into Norway, Denmark, all of them places. After we done all of that, he decided to get rid of the band. That was a good experience for me anyway. After we came back, I got some money, and decided I was going to do a recording for myself. So I went into the studio and did a song, a song called 'Feel The Vibes' .... a song that I wrote, and I recorded it, and master it, press it, and start distributing it in my car to different record shops. What was the name of your label? That was the snake ... 'Cobra.' It was my ex-wife who came up with that name. I had to get rid of that label because I didn't like the snake thing. Two snakes intertwined. But that was the first song that I produced and put out. You did that in New York. Yes, I did it in New York. And people like it because they played it on the radio, and everybody wonder: Who is this guy that sound like Beres Hammond? (laughter) That was my introduction to the New York area. After that song, I found that a lot of producers start coming to me with cassette tapes with rhythms on it they wanted me to record. I was new in the New York area, and I was eager to record. so I started recording a whole bunch of songs everyday. And I spend lots of time in the studio, because I don't know nobody. I don't know where to go besides the studio. I was just coming to the New York area. What studio's were you working at? That would be at Sir Tommy's, Don One, Rough Stuff studio. I recorded an album for Rough Stuff that they haven't even put out yet. Were you doing a lot of dub plates and stuff as well? Yeah, I was doing dub plates. I didn't get to do a lot of dub plates until after '97. After the Studio One album came out. So how did you connect with Coxsone? This guy named Tony Screw, he has a sound system called 'Downbeat International'. He said he liked the way I sounded, and he wanted me to do some dub plates. He said he wanted it on original, authentic rhythm, and him and Mr. Dodd are very close, so he can get the rhythms. So he took me to Studio One in Brooklyn, at Fulton Street. Because they have two studios, one in Jamaica, and one in New York. While I was there singing this song, I noticed that Mr. Dodd come inside and he was just looking, looking to see who was singing. When I came out, he came over to me and said, "Jackson, I like that sound, you know. You sound like ... Jackson there". He no want to call Beres Hammond's name (laughter). He call everybody Jackson. (laughter) I know, that's what Lloyd Parks told me. Yeah. So he said he liked it, and would like to know if I would like to record. So I said, "sure, why not? ", it was a chance to record on Studio One. Even though I heard a lot of things ... I said to him, I said, "I hear a lot of things about you, ou know. I hear a lot of things, and I hear that I'm not supposed to record for you." But, I decided I'm going to get my own experience, and I started to asking him for some rhythms. He didn't offer you these rhythms, you had to ask? No. No, I asked him for the rhythms, because he had to go look for them. I asked him for the rhythms that I would like to sing on. Then he bringing ... he would bring them out, and I would voice them. Sometimes I voice two at a time. So, is there more stuff than just the 'Brother To Brother' album? Yeah, he has another album that's wickeder than 'Brother To Brother,' because of the rhythms I chose. Is he going to put it out? Yes, he is going to put it out. He has got tons of stuff in the vaults. Yeah, that's what I was surprised about. I was surprised how he put out that album real quick. Because he said this thing sound wicked. But he wasn't doing nothing ... Studio One wasn't doing nothing for over twenty years. Were you nervous to be using those rhythms that are considered classics? I wasn't really nervous. It was something that I wanted to do. Because, I knew it could work. I told him, I said, "Mr D., you see when something like this come out, new lyrics on these classical rhythms, it's going to be wicked". I told him, because he even came back and reminded he, and say, "remember you told me that." It's a great sounding album. Yep (laughter), I thought so after a while. Some of those rhythms .... you just can't go wrong with some of those. Why do you think some of those rhythms still sound so solid? Because they are live. They have got real spirit to them. I know what you mean, because even when you hear them redone now, they don't have the same feel. No, they don't have the same feel. When you hear the original 'Full Up,' and stuff like that, you know it is the real deal. Yeah, true. Because, you see, these days you don't have a live band with real people. Sometimes one person play the whole thing, and it's not the same vibe. It's not a group effort, it's one guy's opinion. It's the engineer's opinion, and that's it. Yeah, that's one guy's opinion. They don't have the musicianship, the same feel, the same vibe. That's why you need a band. You have to have a band. The music that Sly and them put out is so forceful, because even though Sly is sitting up there programming the stuff, he is playing some stuff live. Right. He's doing it right while the other musicians are playing, and you get a live feel. After Lloyd Campbell heard ... because I worked with Lloyd Campbell before, you know. Back in the mid-70's, I recorded one song with Lloyd Campbell, a song called 'Tighten Up.' It didn't get released. That Studio One album gave you a lot of exposure. It helped open the market for you. Yes, it opened up a lot of doors. After Studio One album I had this woman that would keep calling my house all the time, calling my phone. I had just moved to New York, just starting to get to know New York, and I heard this woman calling my phone all the time, and saying she wants to talk to me. So one day I caught up with her, and she said "I know this good brethren named Lloyd Campbell, he really wants to get in touch with you." I said, "Lloyd Campbell ... Lloyd Campbell?" She started to describe him now, and say, "Yeah, he used to have a label called 'Spiderman.'" Me say, "Oh, Lloydie." Most of the stuff I know from him is Itals. Yeah, Spiderman. He was the one that broke Worl-A-Girl too, you know. Yeah, he gave them their break. Did you record the 'Get Next To Me' album in Jamaica? Yes, I did all of that in Jamaica. It would have been your first time recording in Jamaica for quite a few years. 'Nuff changes! Yeah, a whole lot of changes. Everybody was talking about the Studio One album when I went to Jamaica though. While I was down there, I seen so many people with cassettes, trying to get me to record while I was there. But we wouldn't go to the studio until the evening, because in the daytime I just lay up in the hotel and chill out. In the evenings we go to the studio. Which studio did you lay the tracks at? We laid the tracks down at Sonic Sounds, voiced some at Sonic Sounds. Then we voiced some at Mixing Lab. I remember a couple of nights we went to Gussie's studio. Was it a good experience putting that album together? Yeah, it was a great experience. Some of the songs were written in Jamaica while I was down there. Are you going to do another CD for Lloyd? I've already completed another one. (Laughter) So, OK, you already have a completed album for Coxson, and you already have a completed one for Lloyd Campbell. You see, when I was recording for Coxson I ended up with enough songs for two albums. And it's the same with Lloyd Campbell. I'm working with Lloyd right now. What about this new album, 'Think About It,' on Brickwall. This is the project the H, C & F (New York studio) put out. This was like a .... I didn't really finish an album with them, you know. Because some of the songs that they have on the album were borrowed from some other people I recorded for. Some of the songs are borrowed from some guy in England that I recorded some songs for. It's fine, but I'm just not happy about the way they did it. Were you not aware that they were putting it out? No. I think that they use trickery to get that album out. Trickery that won't work either ... it don't make sense that they go behind my back, because I know certain things about the business. I could have stopped it, you know. I could have an injunction on it. But, after I listened back to the tracks, I said OK, it will work. And they came to me and decided to work something out. So it went past, but it don't make sense for anyone to try to use trickery where my career is concerned. Because they might want to come back again but they won't be able to. Why grab when you can work it proper and you can have more? They couldn't come back again to ask me for another album .... because we didn't have an album agreement. Yeah, because if it wasn't representing they would have to take it off the market. I know how to ... because I didn't sign an album agreement with them. I could have got a federal marshall and go take the tapes. Because the law would back me on that. I understand that there is another album, one that I have not heard, on Jah Life. That was another one too. He was licensing out the album to Jet Star, and decide not to give me any money. So I had to have my lawyer give him a call, shake him a little bit (laughter). But, we worked that out, and he gave what I'm supposed to get, so everything is alright. That is how you have two extra albums coming out. It's called 'Can't You See' right? Yeah, 'Can't You See.' I don't know why he named it 'Can't You See.' The very first song on it, I don't like it, the cover song. 'Love Don't Live Here Anymore,' you could tell that we had a disagreement, because you have two other people singing on the song. Because I didn't finish the song, that was a song we had a disagreement on, and I say forget it, I ain't singing nothing more. And then he had somebody else singing, trying to make it sound like a combination, with J.D. Smoothe and this girl ... I don't even know the girl. I'm glad that wasn't done on one of my original songs, we would have had a discrepancy, we would have had differences. I've seen a few singles out on the market, who else have you been recording for lately? Recently, I haven't been laying any tracks. All those songs you hear come out ... Well, I did a couple of songs for High Power, this guy named General Lee. Right now are you living in New York or Jamaica? Or are you travelling all the time? I live in New York, but I'm on the road a lot. Do you have any plans to tour as a singer? I have been touring as a singer. I just got back from England. How was that? Were you received well? That was great. I was really really surprised the way they responded to me. That's good. How about America and Canada? Are you going to do some touring? I'm doing shows all over the place. The agency that I work with, they are setting up a U.S. tour for summer. Who is your band going to be? Same band, 'Rough Stuff', the one that Clinton Rowe plays with. He is the band leader. I just did a show with them down here in Florida, Sunday. That's what I came down for on Sunday. At the Brickhouse. It was a full concert, just me and my band. I played for about two hours. Calabash is the band that I used to play with. I played drums with Calabash, with Gregory Isaacs. I saw that there was a live Gregory Isaacs album with your name on it. Yeah, 'Live at the Maritime Hall.' I hate the way they speeded up that ... because we played everything on the record speed, but they speeded it up for some reason. I don't know why they speeded it up - make it sound really fast. I'm down here sitting in this hotel room, working on some rhythms, writing a few songs that I'm working on. Are there any other producers in Jamaica, right now, that you would like to work with? .... There are other producers that want to work with me, but I don't want to run into them right now. I'm just writing new songs. Write them, and keep them. I have a project I'm working on for my 'May Pen' music label, because I'm bring out my own label. That is where I am from May Pen in Clarendon. So I have that label registered with B.M.I.. So you are going to start doing some self productions? Yes, self productions. I will be working with Lloyd Campbell, but I'm going to start to produce some things. I have a few other little young guys that I would like to bring out on my label.